Corboy & Demetrio has been named to 2016 "Best Law Firms” for the sixth consecutive year, since the award’s inception. The rankings were announced by U.S. News & World Report and released to the public on Nov. 2, 2015. 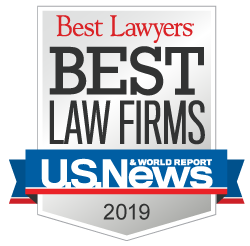 Corboy & Demetrio earned the ranking of a Tier One law firm in Chicago in the practice areas of plaintiff’s personal injury and medical malpractice, the highest rankings a plaintiff’s law firm can attain in both practice areas. The firm, which also represents plaintiffs in commercial litigation, received a Tier One ranking in that area in Chicago. “The rankings reflect our lawyers’ deep commitment to our clients, said Corboy & Demetrio Founding Partner Thomas A. Demetrio. Firms included in the 2016 “Best Law Firms” list are recognized for professional excellence with persistently impressive ratings from clients and peers, and to be eligible for a ranking, a firm must have a lawyer listed in The Best Lawyers in America, which recognizes the top 4 percent of practicing attorneys in the US, according to U.S. News. Corboy & Demetrio has six lawyers named to Best Lawyers in America 2016 in the areas of personal injury litigation, medical malpractice and commercial litigation. They include Thomas A. Demetrio, David “Chip” R. Barry, Jr., Robert J. Bingle, Philip “Flip” Harnett Corboy, Jr., Michael K. Demetrio and Rene A. Torrado, Jr. Tom Demetrio and Chip Barry were also named Chicago Medical Malpractice Lawyer of the year by Best Lawyers in America in 2011 and 2014, respectively.